Nikon has taken the wraps off its new AF-S 105mm f/1.4E ED prime lens – and it should get portrait photographers across the world very excited, thanks to its groundbreaking maximum aperture for a lens of this focal length. The fastest full-frame lens of its kind, Nikon believes the ultra-fast f/1.4 maximum aperture, combined with the nine-blade diaphragm, should produce stunningly smooth bokeh. This should not only enable you to easily isolate subjects, but also offer incredibly smooth transitions from the point of focus to the background, resulting in images with a natural-looking sense of depth. This, and the medium telephoto focal length with a minimum focusing distance of 1m, should make this a very tempting lens for portrait photographers. 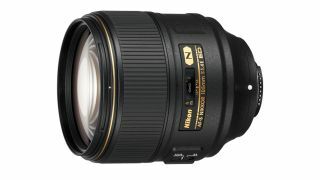 As we've seen on a host of recently announced Nikon lenses, the 105mm f/1.4 features an electromagnetic diaphragm (denoted by the 'E' designation), which is designed to provide highly accurate control of the lens's rounded diaphragm blades, to ensure more consistent exposures during continuous shooting. There's no image stabilisation – the lens tips the scales at 985g as it is, and stabilisation would have made the lens even heavier – but the lens has been designed to withstand dust and moisture, and includes Nikon's Nano Crystal coating to reduce ghosting and flare. The lens is expected to be available in August, priced at £2,049.99 / $2,199.95.